The NCD Alliance convened several NCD Cafe sessions and a side event at the impressive Africa Health Agenda International Conference, hosted by Amref Health Africa and the Rwanda Ministry of Health at the Kigali Convention Centre from 5-7 March 2019. The conference has become the biggest health-focused gathering on the continent, attracting over 1500 delegates to discuss pathways to achieving universal health coverage (UHC) in Africa by 2030. By 2030, NCDs in Africa are projected by WHO to exceed deaths due to communincable, materal, perinatal and nutritional diseases combined. Further research is needed into the number of people living with multiple chronic conditions as estimates vary from 13-95% of patients worldwide affected by “multimorbidity”. Our panellists - Dr Zipporah Ali of the Kenya Hospices and Palliative Care Association (KEHPCA), Katja Iversen, President/CEO of Women Deliver, Catherine Levy, Head of Global Health Programmes for NCDs for Sanofi Global Health, Joshua Makubu of the Ghana Society of the Physically Disabled and Ghana NCD Alliance, Dr Eva Njenga, Chair of NCD Alliance Kenya, and Dr Gang Sun, Senior advisor and UHC Focal point at UNAIDS - agreed on the urgent need to move past those silos and make sure that Health Coverage becomes genuinely Universal. The session reached a strong consensus that health advocates must work together more systematically. As Katja Iversen put it, “The UHC deal is not yet done. It is not about slicing the cake for different diseases. The cake isn’t baked yet, we haven’t even got the ingredients together! The funding is not yet there.” Advocates across global health must work together and stand united for a common set of priorities for all communities, to make a success of the forthcoming UN High Level Meeting on UHC. The East African NCD alliance convened in Kampala recently to review progress to date, and discuss NCD advocacy strategies for the year ahead. 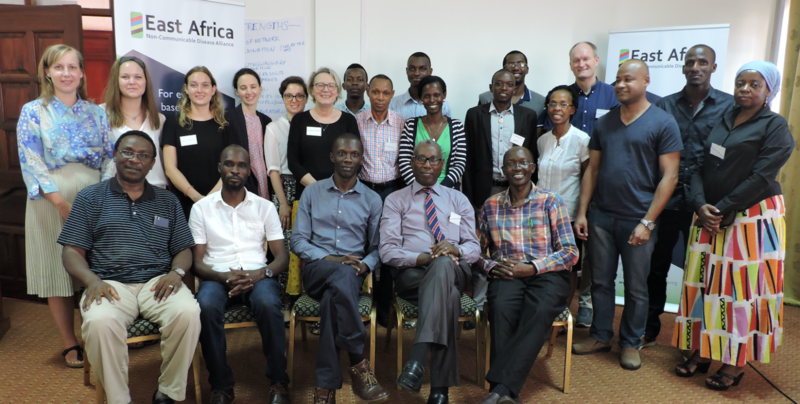 In recognition of the challenges facing NCD research in Africa, the East African NCD alliance has spearheaded a new continent-wide group to facilitate multi-sectoral and coordinated research efforts between multi-disciplinary teams. Zambia is currently experiencing a major increase in the burden of noncommunicable diseases, with mounting social and economic costs. In response, the Zambia NCD Alliance has been recently formed.